A story of the beginning of the legend of King Arthur's the Sword in the Stone. 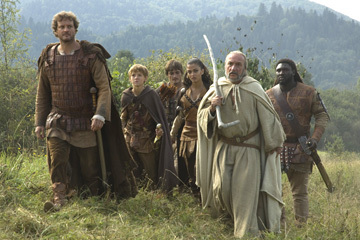 Info from Yahoo movie site: "Rome, 476 AD. The Roman Empire, a mighty force for almost 500 years, is being threatened. On the eve of twelve-year-old Romulus Augustus' crowning ceremony to become the new emperor, Barbarian general Odoacer arrives in Rome to make a deal with Orestes. Odoacer makes demands of the Roman Empire in fair exchange for his decade-long support of the Roman legions in the east. But Orestes refuses. On Coronation day, as all of Rome gathers to watch the proceedings, Ambrosinus, the shaman who is a mentor and tutor to Romulus, predicts danger. Orestes is worried about his son's safety and appoints Aurelius of the fourth legion to be his personal guard. That night, Aurelius and his legionnaires confront danger--Odoacer and his army have returned to Rome. With a deafening roar, the Barbarian army storms the city. With Orestes slaughtered, Romulus is captured along with Ambrosinus and taken to the island fortress of Capri. But, not all the Roman legionnaires are dead. Aurelius is alive and when he learns that the Byzantine Empire will give Romulus sanctuary, he embarks on a journey to the coast accompanied by a small group of his men and a mysterious, black-clad Byzantine warrior. Later, Aurelius discovers what lies behind the black clothing--a beautiful, young woman named Mira. Thanks to the strategic cunning of Ambrosinus and the fighting skill of Aurelius and Mira, Romulus is freed. But, when the group arrives on shore, they learn that the Byzantines have joined forces with Odoacer's army of Goths. 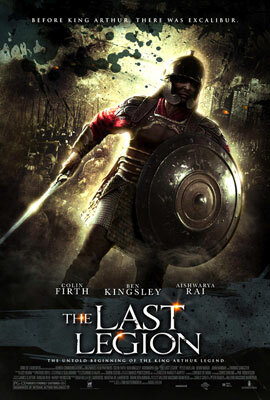 Faced with such betrayal, they must find the one legion still loyal to Rome--the ninth legion in Britannia. As they set off in search of the last legion, Romulus and Aurelius together embark on a new beginning." The movie as an escapist movie was not as bad as I expected, but as a precursor or a beginning of the legends of Arthur it was pure fantasy. It stole the champion's sword forged in Britannia from a star-stone from other legends or maybe Jack Whyte's Skystone and made it into a sword forged for Julius Caesar, held in trust by all later Caesars and hidden away for the last. Add a little prophecy that it must return to Britannia for the true ruler and we have a setup. Send Ambrosinus aka Merlin to be the last emperor's tutor and to help find the sword and we have the setup. Throw in a Saracen warrior, I mean an incredibly beautiful Oriental martial arts trained woman, to be the love interest and to keep the young teenage male audience entertained, and to join the "Fellowship of the Sword" or is that ring, I forget. I found it to be a great laugh to see the fellowship of warriors united to protect the young emperor (hobbit with a sword) set off on horseback across the length of Europe, passing unharmed and unprevented through all of Odoacer's Gothic lands, crossing the snow covered Alps on foot (could have taken footage from Tolkien movies), across the warring lands of Gaul and the struggles of early Frankish kingdoms, somehow crossing the dangerous channel, and traveling the length of Britain to arrive at Hadrian's wall looking for the vanished 9th Legion, all to confront a silver masked Vortigern, wow. So many other issues. But for the viewing, I turned off most of my mind and just relaxed into a Dungeons and Dragons alternate earth.